"You wind up creating from silence, like painting a picture on a blank canvas that could bring tears to somebody's eyes. As songwriters, our blank canvas is silence. Then we write a song from an idea that can change somebody's life. Songwriting is the closest thing to magic that we could ever experience. That's why I love songwriting". Songwriting can be an excellent way of enabling students to express themselves about topics that are important to them, and in musical styles and genres with which they are familiar. 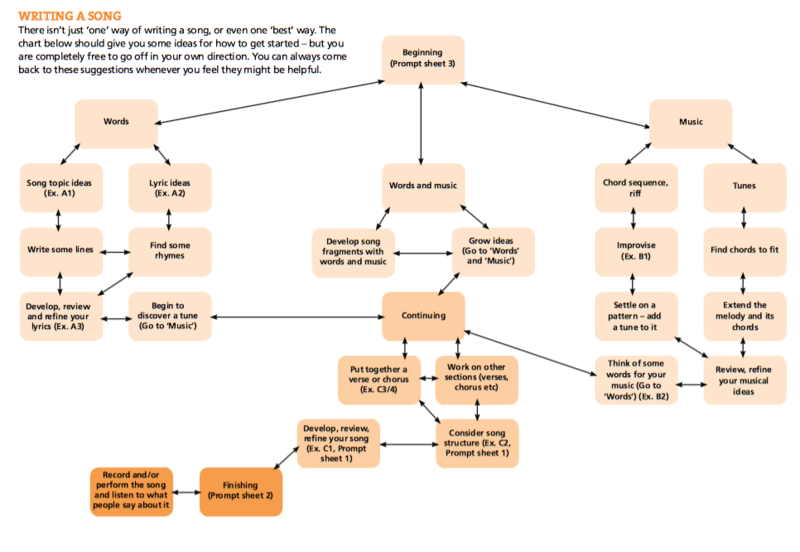 This guide suggests some processes, techniques and ideas for encouraging students to write their own songs, without suggesting actual musical or lyrical content – this should come from the students themselves. All songwriters, whether individuals or groups, write best in their own way, in the order which suits them and their songs, and very often dealing with more than one aspect of the writing at a time – for example, coming up with words and music together. Furthermore, they may well write different songs in different ways. So there is no one way to teach songwriting. Consequently, there isn’t one set way of using this guide. We have suggested a skeleton structure for how you might incorporate this guidance into a six-week project. However, this guide could also be used in a much less formal way, to support students working on composing/ songwriting using informal learning approaches. Your students may not need to use these prompt sheets and they should be offered as optional guides, rather than fixed instructions. The following set of activities provides a step-by-step guide for how students might start, continue and finish a song. This is not a prescription of how students must write songs, but a series of suggestions and exercises for things they could do, especially if they get stuck. It is important to stress to students that, when they express themselves in a song, no-one can say that something is right or wrong. However, it is beyond doubt that some songs are better than others and the care used when choosing notes, lyrics, chords, etc, can make the difference between a satisfactory school exercise and a song which is really exceptional. In this project, we use the word ‘write’ for making up or creating words and music. This does not necessarily imply writing on paper – and it refers both to the mental activity of creation and the recording of the song. Though some students may prefer to write songs on their own, the material here is written for groups of students writing collaboratively. 5 awesome quotes about songwriting-perfect for your classroom wall! We make specific suggestions for linking listening with songwriting throughout this guide, to encourage students to listen to as many songs as possible. Students are likely to prefer writing the sorts of songs they enjoy listening to, but encourage them to challenge themselves and write other types of songs as well. Not only will this expand the range of possibilities, but it should improve their overall songwriting style. It also could lead them to discover some new music which they would never have chosen to listen to. Recording and reviewing work is a critical part of the creative process. It can be particularly frustrating for students if they forget an idea developed in a previous lesson. Flipchart pads and pens should be made available for jotting down ideas and lyrics in progress in whatever way the students choose, and also audio recording devices to record their ideas. These ongoing notes/recordings should be available every lesson. Recording (either audio or video) is also a crucial way of tracking student progress, both for the teacher and students. It can be very beneficial for each group of students to have a means of jotting down ideas aurally. This could be on their mobile phones (depending on school policy), or other available recording equipment. will be protected by copyright. Students often ask whether the words or the music are written first in a song. It may be either, or both together. However, it can be useful to decide before starting what the song is going to be about, which may or may not actually be mentioned in the song. Students using lyrics as a starting point should work through Exercises A1–A3, and students using music as a starting point should go straight to Exercises B1/B2. If students are beginning with fragments of words and music together (lines for a song) they may use aspects of both methods simultaneously. Songs don’t need to be written in the order in which they are sung/performed when they are finished. In practice, songwriting usually happens as a non-linear process, therefore students should follow the exercises in the order most appropriate to them, and be able to revisit the exercises and refine their work as and when necessary. Students start by establishing the theme/topic that their song will be based on. It is possible that their ideas will be a mixture of words and music or even simply bits of tunes or chord progressions. If the ideas include music, see the B section (page 107). How many of the lyrics refer to the central theme/topic? Do they tell you everything at once or build up a story? Why are these so good? Are there any places where the words and music don’t fit together well? Does this spoil the song? How are rhymes used – on any words, or on words important to the message? Do the rhymes fit with the rhythmic stresses in any way? Are the words easy to sing: which vowels work well on long notes; which consonants get lost when one word follows another? Students should now be in a position to develop their lyrics, using some of the material they have developed in Exercise A2. Is that structure then repeated immediately afterwards? If so, is it changed at all? Is it used again later in the song? How do other two-line phrases – different ones in the same song – relate to the one they chose? Why are things so often expressed in two-line phrases? At this stage, it is particularly important to encourage peer feedback, because having another point of view can open students up to writing a song which will be relevant to more listeners. It can also alert students to a songwriting ‘habit’ which they may use without being aware of it, or warn them of other songs which they may have copied by mistake. Remind students that the language of song lyrics is different from that of speech, stories, official forms, or even poems. This is because the sound of the words is as important to the message as the meaning. It is also because the songwriter may want to imply more than is being said openly. The music also contributes to the meaning – sometimes the music and the lyrics can give deliberately different messages. Students will need to consider what type of language (vocabulary and grammar) they will be using. In this exercise, students use jamming and arranging to work up musical ideas for their songs. Students should now have some small sections of a song with words and music. At this stage, the sections may not fit together, but they should feel like part of the same song. Regularly reviewing and refining music and lyrics is an important ongoing part of the songwriting process. Students will potentially have some song material by now, probably still as separate bits. Students can use any structure they like to put this together, however we suggest the basic verse and chorus structure here: Verse 1, Verse 2, Chorus, Verse 3, Chorus. Listen to what is ‘said’ in each part of the song. Do the words in a verse have a different message from another verse, and from the chorus? Students now work to finish their choruses. Is there anything that still needs to be ‘said’ in their chorus? Does the music feel complete in itself or is there something missing? Check that the students are sure that what they actually have is a chorus. Might it be a different section? How long is it, related to the verses? Is it in the same key as the verses? Does it end with the home key or lead to that? q Does the rhythmic feel change in it? Then encourage students to write their chorus on the same model. Students now work to complete their verses. Find out if any rhymes then come back later in the verse, if so what effect does that have? Analyse what is taken forward by each new verse of the song. Is anything revealed that was hidden before? By now, students should have a song structured Verse 1, Chorus , Verse 2. (There may be more or fewer than two verses.) In a six-week project, students may only get as far as this, and it is a good achievement if they do. But if they have the opportunity, they could now extend and refine what they have already written. The student prompt sheets are designed to provide some questions and ideas students might consider if they are unsure about how to finish their song. Performance opportunities can provide motivation for students to finish their songs, and also a sense of achievement when performing music of their own creation to others. Therefore, we would strongly recommend building in some form of performance at the end of any songwriting project – either recording student work and uploading it shared online spaces within school guidelines, students performing to their classmates, or performing in a school or local concert. The following provides some guidance on questions that may come up when running a songwriting project. 1) Should students use rhymes in their lyrics? Rhymes play an important role in the effect of a song. Because people expect them, there is often a feeling of disappointment if they are not there. However this doesn’t necessarily mean they have to be used. If students need a rhyme, but can’t find one, they could try changing the order of words in the sentence to have a different one at the end (for example ‘leave for the town right away’ changed to ‘leave right away for the town’). However, no rhyme at all is usually better than a sentence which doesn’t sound right (for example ‘right away, for the town you must leave’). However, if this gets taken too far it often doesn’t work. This will depend on other things, such as how rhymes are used elsewhere in the song. Encourage students to try saying the phrase out loud and listen to it carefully. If they have to do this a few times before they are happy with it, it probably isn’t good enough. Rhymes need to be made by matching the strong syllables: ‘singing’ rhymes with ‘ringing’ and not with ‘one thing’. A rhyming dictionary can be a useful resource to have available for students to refer to. Or they could write their own collection, based on the topic of the song. 2) Does it matter if it is difficult to sing the words? This doesn’t matter provided that somebody can sing the words. But as students probably won’t want their songs to be show-off pieces for clever singers, encourage them to do all they can to make the words singable, either by changing the speed or rewriting the music. Using one note per syllable can work well (unless students are looking for a specific effect). It is always effective to match strong beats, rhymes and words which are important to the message of the song. 3) Does the rhythm come first from the words or the music? It depends, and it could be either, but what is important is that the words and music fit well together rhythmically. When speaking the words, you would be unlikely to have long extended syllables in the way that you do when singing. From this point of view, the music is more important in giving the rhythm. But in all other respects it is the other way around, the song will work if the rhythm fits the words and it won’t work if the rhythm doesn’t fit the words. 4) What if a student is struggling with writing tunes to lyrics? Encourage your students to repeat their lyrics in rhyme with the accompaniment, and gradually a simple tune should come. If it doesn’t, they could try writing a simple chord sequence and choosing one or two of the notes of each chord in turn, singing the words on those notes until the chord changes. Then sing the next bit on notes from the next chord. Again, a tune is likely to emerge gradually. Another approach is to write the tune first and then add the lyrics. Often, during the course of working on a song, the tune will change as people keep singing it, and this can mean it gets better. 5) One of my students’ songs sounds like somebody else’s, but they don’t want to make big changes. Sometimes changing just one small part of a tune can make a lot of difference, especially if it is the first, last or highest note. Encourage your students to try to find another note which fits with the chord and carry on from there. Then, they may be happy to move a few more notes around. Another method is to keep the notes the same but change the rhythm. For example, a tune that starts with four even notes will sound very different if you make the first note longer and the next three shorter. This may also mean changing the words. Students may also consider changing the chords. This can have a surprisingly strong effect on how the tune sounds. 6) What if the verse and chorus sounds the same? Alternatively, unless their song is of the kind where this doesn’t matter (as in some kinds of Blues, for example) it might be worth writing a new tune for one of the sections. Is this because they keep repeating the same idea? Could they say the same thing in different ways? Encourage them to try changing one or two words to see what happens. Or try changing where the main word (which relates to the topic of the song) is placed; at the very beginning or end of a line is often good. Changing the order of the verses may help. is worth students analysing good songs to find the moment when something new is brought in. Sometimes, words sound dull because they are not focused on one subject and wander between different ideas. Unless this is the whole point of the song, students could improve lyrics by making sure that they keep to the subject. You could also encourage them to think of a new image to express their ideas (if something is boring, maybe it feels like having to ‘live with your head full of porridge’; if someone is beautiful, maybe that person ‘makes you feel like rain is made of fizzy blue water’) or to come up with a surprising way of saying what you think, by exaggerating (‘the lesson lasted a million years’) or using unexpected words (‘he plays football like a soapy superstar’). Does the music contain too many lines with the same tune following one another? Do the chords always come in the same order and end the same way? q Does the bass line only ever play the main chord note on the first beat of the bar? Could the highest note in the tune get moved towards the end of the section? Could the rhythm in the accompaniment get adjusted slightly to change the feel? Is the texture always the same? 8) What if the group disagrees about something in the song? This can be the result of having a few students with strong creative ideas in the same group. Encourage everyone to try out all of the ideas, ensuring everybody’s suggestions get heard. They may then discover what works best, and choose from all the available material. Encourage students to play different versions of the song to other people – students from other groups for example – whose opinions they trust, and ask for comments. As the publisher of this work, Paul Hamlyn Foundation has an open access policy which enables anyone to access our content electronically without charge. We want to encourage the circulation of our work as widely as possible without affecting the ownership of the copyright, which remains with the copyright holder.